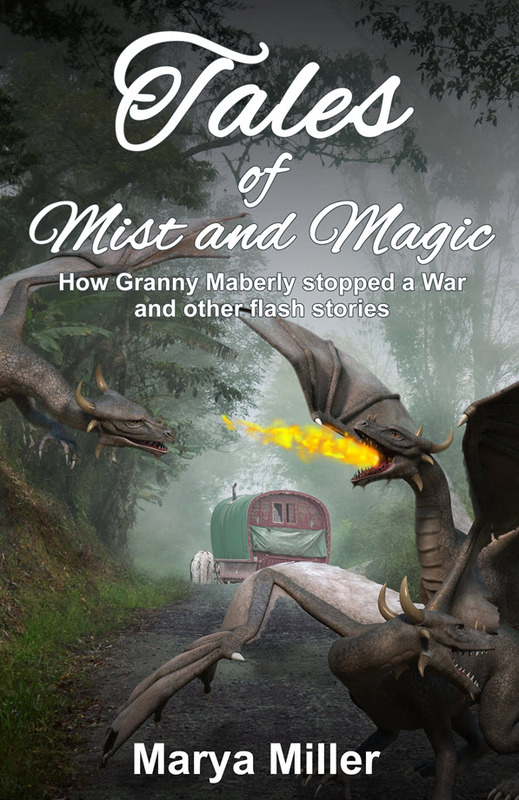 Here you can read a story from my Dragonish flash-fiction anthology, Tales of Mist and Magic featuring (among other characters from the Island of Dragonish) Granny Maberly, a ninety-four-year-old Wagonwalker matriarch who smokes a pipe, has a mouth like a knife gash and who once knocked out the hetman, Big Mordo, just for making a joke about her whiskers. You can read another Granny Maberly story, Silent Knight, in the blog section. Under the Splintered Mountains, a full-length novel featuring Granny Maberly and several of the characters from Tales of Mist and Magic, is set for release in November 2018. Fastday was the oddest day that Granny Maberly could ever remember. It started with an attack from a pack of Thren dragons out on the open moor, wagonrolls from anywhere. Fortunately, these were young ones, not yet capable of roasting whole dogs or small children, but still able to give animals and people alike nasty burns. The horses panicked, Sorsha and Andro’s wagon overturned, and Granny’s band barely made the Sisters before the little dragons swooped back for another run. The Thren grew bored, waiting for their victims to leave the ring of tall stones. They spotted a fox, and disappeared over the horizon in pursuit. It took the tribe the rest of the morning and well into the afternoon to fix Sorsha and Andro’s wagon and round up the horses. They barely made it into Market Haling by sunset, just before the wooden gates closed, but there was no supper for Granny and Tirzah. They were summoned straight away to a breech birthing, which lasted late into the night. She woke up in the middle of the night with stomach pains coursing through her gut in waves. “That girl must have baked her bread with stones and grit,” she groaned at the kettle. It was a fine night, with a full moon, so she got up, dressed, and hopped down from her wagon, meaning to walk off the gas. Granny had hardly walked the length of the square when a great, dark shadow flitted in front of the moon. She sucked in her breath. The shadow swooped lower, filling her field of vision. It landed on the Town Hall roof with a thud that shook the building. Granny noted, awed, that its head was bigger than a barrel. Golden eyes like dinner plates blinked down at her, brimming with wicked intelligence. Granny stuck out her chin. NO. I AM A DRAIG. I AM SAMMOTH, THE WEST DRAGON. THE WINDS AWAKEN. The great voice boomed in her head, leaving her rocking in her boots. NO. THE MORAG AWOKE AND I WAS FREED, FOR I AM HIS KIN. PERHAPS NOT. THE MORAG IS VERY OLD. HE HAS GONE BACK TO SLEEP UNDER THE SPLINTERED MOUNTAINS. ONLY I REMAIN AWAKE. I TOLD YOU, CRONE. THE WINDS AWAKEN. And the Draig gave a great groan; and its nether end made a noise like the creaking of a splintered mast. Enlightenment sprang upon Granny. She was feeling much the same way herself. She was glad the Draig’s back end was facing the other way, hanging over the far side of the Town Hall. The dragon grinned; a terrible sight. Teeth the size of hammers gleamed in the moonlight. I WILL GO ROAST THEM ALL AND CHASE THEM OUT TO SEA. I DO NOT LOVE THE THREN. THEY EAT FLESH, AND GIVE MY KINDRED A BAD NAME. WE DRAIG EAT ONLY TAR SHALE AND WOOD: TELL YOUR KINDRED! The huge beast launched itself off the roof, knocking down several tiles. It sailed off across the moor. When Granny told Tirzah and Sorsha the next morning, they laughed. But when they got back on the road that wound over the high moors, the wagonwalkers did not see a single Thren.